Durring New York Comic-Con TWD panel, it was revealed there is a crossover between The Walking Dead and spinoff Fear The Walking Dead coming. The two AMC shows are based on the comics created by Robert Kirkman. “There is one character that is going to go from one show, that I will not name, to another show, that I will not name. 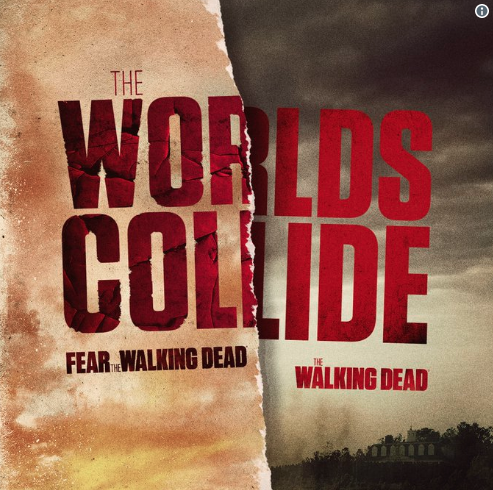 This is a huge event in the world of The Walking Dead,” he added of the crossover expected to occur in the next year. The TWD panel included cast members Andrew Lincoln, Norman Reedus, Melissa McBride, Lennie James, Tom Payne, Katelyn Nacon, Austin Amelio and Jeffrey Dean Morgan, who plays arch villain Negan. EPs Kirkman, Gale Anne Hurd, Greg Nicotero, and David Alpert joined them. Season 8 of the AMC blockbuster is 16 episodes long, with that SUPER annoying break in the middle.